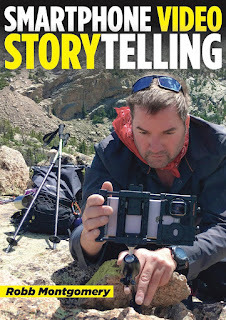 Lesson videos for the Smartphone Video Storytelling book by Robb Montgomery. Which phone is best for Mobile Journalism? He teaches the certificate course in Digital Storytelling for the public information officers of the United Nations and trains reporters from CNN, The New York Times, Reuters, Channel News Asia, Belgian Public Television, Russ Media, Al Jazeera, and Singapore Press Holdings. He holds a b.a. in Journalism (1990 - Eastern Illinois University). He is @VideoJournalist on Twitter. His clients include Reuters, CNN, Radio Free Europe, TVN, TVP, VRT, MTV3, France24, Al Jazeera, Mediacorp, Correctiv, Reporter Fabrik, Russ Media, APA, WAN-IFRA Asia, Channel News Asia, SPH, IREX, Thomson Reuters Foundation, Caritas, and The New York Times.